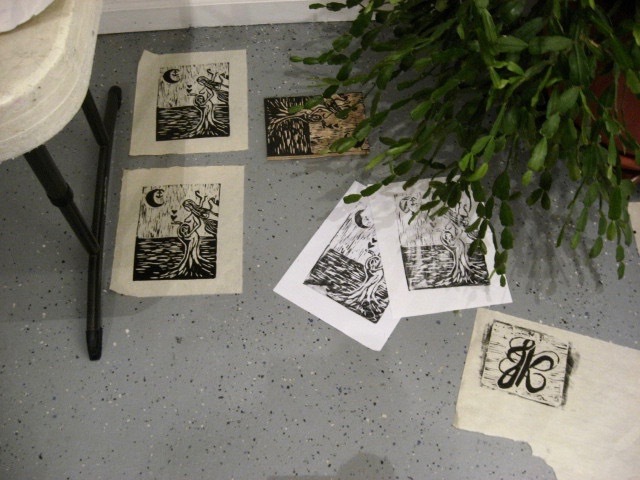 Tonight was week 3 of the latest woodcut workshop in Belmar. All six students were there and jumped right into working. 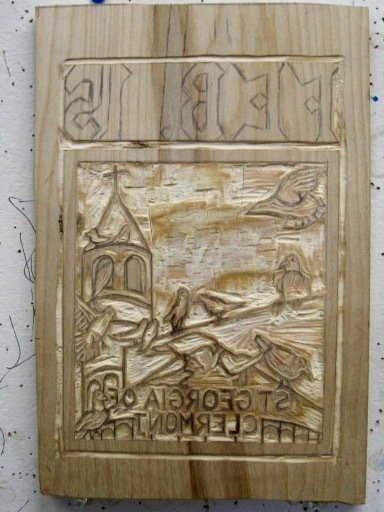 One of my students is a teacher and found some unwanted wood carving tools at her school, which allowed her to finish working the whole block. Thus she was ready to print early on, which got the other students excited about printing. By the end of the night, five students were ready to proof their blocks. 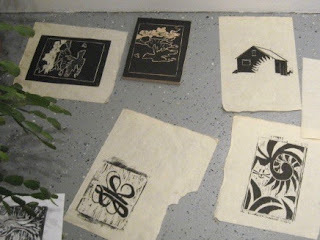 (the only one who wasn't was the woman who joined the second week, and was also doing the largest piece in the class) Below are a few photos showing the results of that first set of prints. None of these pieces are officially done, but all were impressed by what they had accomplished so far. One thing I've seen many times over the past few decades is how excited students get when they start inking their first block- as the brayer starts depositing ink on the surface it gives instant power to the positive and negative shapes. Days and weeks of work are suddenly paid off. When the designs are good (and my group tonight had some good designs) that first inked block can be powerful. That is quickly followed up by pulling the proof, which moves it to paper and lets them see the mirrored image for the first time- a bit of a shock for those not used to it. We'll be off next week for the holiday, then have one more scheduled meeting. There was some talk tonight about continuing beyond next week, and I'm open to running another session later this summer, but that's up to a lot of other people. Late yesterday I got a phone call from Molly, one of the artists in our Studio. Other than a brief chat at Herb's Memorial Service last week, haven't seen or heard from her since the spring semester ended. The call was regarding a potential problem in our space. Said she had been working (producing product for Jackie, who is also the third artist in our space) when she heard what sounded like a heavy dripping. Looking up, she noticed something, including part of the ceiling bulging. 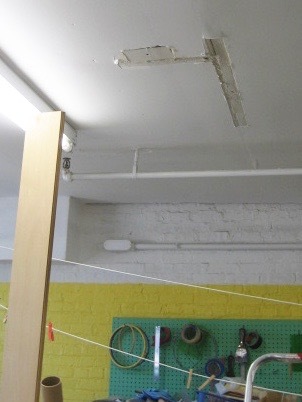 We've had some unusual weather lately, including occasionally heavy rainstorms, and she was concerned that perhaps a massive amount to water had found a path into our ancient building and was about to enter our Studio space. Would not be the first time we'd have a flood, though the last time was because of underground town pipes. She reported it to to people running the building, and then let me know about it. One bit of good news was that it was on the other side of the room, away from my table and prints. Since I had some errands to do today anyway, seemed a good idea to work my way up to Ocean Grove and see the situation for myself. The building was fairly empty- not many tags up on the hooks. From the top of the stairs I turned on the basement light, and saw no flooding yet. Always good. Descended and turned on more lights, still no standing water. No water coming from under our door into the hallway- another good sign. Unlocked the door and went inside. No standing water anywhere. 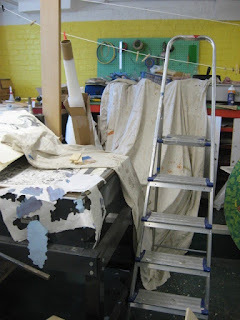 The only unusual sight was a large canvas drop cloth/tarp draped from the press to the cabinet by the wall, in the area where Molly had noticed issues. Again, no standing water or continuing drips, but a bunch of peeled paint and plaster dust on the floor around the press. Above the press no bulging ceiling, but something had been cut, probably the source of the debris on the floor. No tags for the Kelly Boys were up, but I had seen one for Little Bobby Duncan, and heard music coming from his space, so went to go see if he knew anything. He had not been present when this was happening yesterday, but got the story from Mike, another person who does some work for the building. It seemed that there was a problem with the air conditioner in the classroom above ours, and instead of draining properly, the water generated was leaking down into the basement. I showed him the current state of my space. His guess was that the air conditioner had been moved (or its drain fixed), which seemed to have relieved the worst of the problem. So no immediate crisis to deal with. I'm assuming the ladder and tarp were left in place for now and will be cleaned up when the ceiling is patched- I guess next week. If I had something to work on it seemed the area around my table was fine, but I had no project to work on today, so I locked up, stopped in Belmar to pick up the money coming to me for my additional student, and headed home. Later I gave Molly a call and an update on what I had learned today. Time for week 2 of the 2017 BAC woodcut workshop, and a few things have happened since last week. First, I ordered some more supplies- ink, tools. Bought more hand soap, inventoried my refound water based ink, but I still need to order some more paper. The other change is that the class grew from five to six students. Was contacted my e-mail a few days ago and asked if it was possible to join. She was willing to pay the full tuition so I said yes, and tonight she had checks for the class and materials. After that it was business as usual. Everyone had sketches, which I reviewed and advised. Cut off blocks of wood for those who didn't have them yet, and they got started. Just showed a few prints tonight, giving them more time to work. Talked tools one more time and gave a quick demo of the proper way to use the various gouges. On a regular basis I worked around the table, giving cutting and tool advice. One of the concerns raised last week was how to avoid cutting oneself, so for the demo I brought out one of the bench hooks. Went over well, because I ended up passing out all I had. And one bandaid, despite the demo and bench hooks, but just a minor injury. A few felt some soreness in their joints, but first time cutting after a long time without and I can feel the same way for a little while. You get over it. No one finished a block tonight, but all made good progress and had to be reminded that the class had ended and it was time to go. Next week cutting continues, and printing if anyone is ready, but I doubt anyone has their own tools, so we'll see if that happens. Tonight was the first meeting of my latest round of woodcut classes in Belmar. It's been a few years since I was able to hold it, the problem being lack of students. We put it back on the schedule in the spring, but only one student signed up. We decided to try again for an early summer class, so that spring student returned, and we got four more, for a total of 5. Very respectable number. Took about 3 trips to load my car with all the necessary materials, and that's with some stuff already stored at the Boatworks. I got there a little past 6, with the first student arriving as I was still unloading my car. All five paid up students were there. As has happened before, I was too busy teaching about woodcuts to think about taking photos- maybe in future weeks when they're all working and have something to show. Later this week my entry for the upcoming Bird themed show in Belmar is due, so I figured it would be good to get this print done. One difference from last time is that I brought with me a bird identification book with lots of images of various pigeons and doves (biologically the same bird), plus my plan for the 2nd try. As I said last week, I preferred the lighter version of the walls on the tower, so brought a color closer to that to the main church and apse walls. And instead of the blue-gray that I put on all the birds last time, plumage that is more accurate to the birds. Turns out that pigeons are one of the most common and widespread birds on earth, and thousands of years of breeding has resulted in a wide range of colors, and I tried to reflect these options this time around. One effect of the lighter color on the walls is that the name of the saint is easier to read compared to the first experiment. Not planned, but it works out. Not as much color in the birds, but it's still a good balance, and the value balance also holds up. And if you compare the above image to the one from last week, the quality of the black printed ink is much better, which is why the last proof was my initial practice/experiment copy. Is this the final version? I don't know, but it's good enough for submission to the show later this week, and the color choices may hold up to be the final version. On Sunday, June 4th, the Jersey Shore Arts Center held a large visual arts event, a group show that filled much of the building. 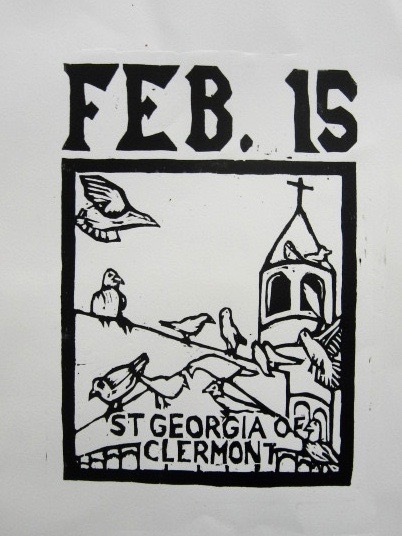 Unlike the recent WinterArts festivals, this one included artists not currently connected to the building, a former high school that has been transformed into a regional art center, mostly through the hard work of volunteers. We had a good turnout at the show, but the one person missing was Herb Herbst, the man behind the JSAC and one of the hardest working people there. However, earlier that day one of the many artists who have studios there found Herb needing medical help. Not the first time our leader had to be dragged to the hospital and away from his pet project. One of the grandsons supervised the well attended event, while the rest of his family joined him at the hospital. Unlike the other stays, this time Herb didn't come back- passing away a week ago. Word quickly spread through the building (I had been proofing my newest saint block), and while no one was surprised at his passing, we were all a bit stunned. Despite being in his 90's, he was still there most days, often pitching in with physical labor. We are all wondering what this means for the future of the building, but the word is that plan is to go forward with everything on the schedule and maybe to continue expanding. Many of the visitors to the recent show were first time visitors to the building, even though it has been on the edge of Ocean Grove for more than a century. And Herb realized before most people that the building was a treasure of late 19th century architecture and came up with a plan to save it. It has been a lot of work and it's a gradual process- the 3rd floor was only occupied starting a few years ago. But it's a going concern, and a very active place. None of us are sure what comes next, but as long as I am working there, I'll be recording my activities on this blog. The past few days have been devoted to things related to employment, which has given my proofs of the latest saint print time to dry. Meanwhile I had spent some time studying colors and considering my options. Originally in my head I was thinking a basic gray for all the stone of the church, but two things changed my mind. 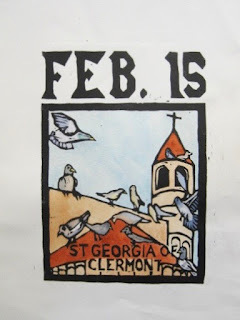 First, I still haven't had time to buy more watercolors, including the hues that typically make neutral grays, and if this church were gray it would take a lot of paint. Second, pigeons/doves have a lot of gray color in their feathers, and I'd like them to be seen. Warmer color architecture would give more contrast. Besides, I know enough art history to know that while neutral gray is the common color of neoclassical architecture, back in St Georgia's day all kinds of color stone was used, so I had options. For today's color test, I was using the 2nd lesser proof from my printing session a few days ago. I knew I'd go with a typical blue sky, so put that in first, some pthalo wash. The stone walls are all done with a limited edition burnt sienna, with the variety in value coming from gradually adding more water. For the various roof sections (tower and apse) I went with one called terre ercolano, which is pretty much a terra cotta, standard for roof tiles all over Italy and not uncommon in traditional European architecture. Had no bird photos with me today, so I just put down some blue/gray colors that I associate with this type of bird, premixed colors I already had on my palettes. In the final version, I will play around with intensities (so far I prefer the lighter value brown on the tower to the darker version on walls in the foreground) but I think this general palette will work well. I will research bird plumage patterns a little more, but when I go in next week to color the final version, this color combination is what I expect to use. 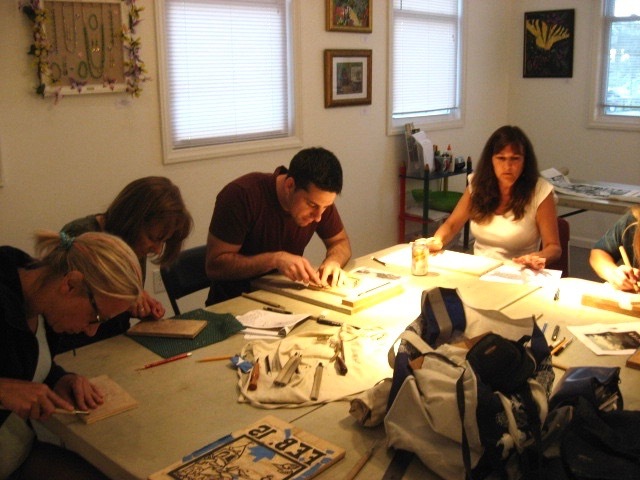 Back a few years ago my Belmar woodcut class was running fairly regularly- 3 to 4 sessions per year. At that time, I was granted some storage space in the Boatworks, a piece of a shelf in the closet/storeroom that was part of the addition that was added to the building. (the bigger piece of that addition became a multipurpose space that these days is the dedicated classroom space, and my upcoming woodcut class will be held there) My woodcut class has been put on the schedule a few times since then, but hasn't made enough enrollment to run most times, and not at all for a few years. My attempt at a late spring/early summer class this year also failed to get off the ground, but my one paying student from that class was really determined, let her tuition payment ride, and was joined by several new students for the session that will be starting next week. That means I will have to order some more materials soon- ink and paper that are essential to the process but just not widely sold in any stores around here. Besides consumables, this process requires some tools, which I began accumulating in the more popular years, and I still have most of that stuff. Gouges, brayers, etc. 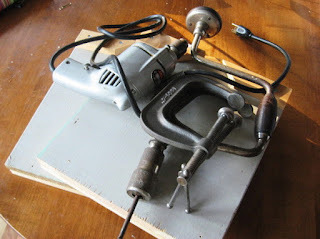 For example, I had made a number of bench hooks from old scrap wood, a simple device that can be purchased, but can also be constructed and can make cutting easier to do. A few of my students have been impressed enough to make their own for working at home. They are heavy and bulky, and between classes I keep them in the Studio, but I had some free time this afternoon, and knowing that I have an available storage bin at the Boatworks, it made sense to start moving some stuff to the location I'll be teaching in. So I took a ride up to the Studio in the late afternoon, grabbed all of them (have 6, enough for my official class size as of now) and brought then down to Belmar. Grabbed my plastic storage bin from the shelf and found it wasn't empty. It contained a tote bag full of inks, large tubes of water based relief ink, all colors. Could have used this in the spring when my Intro class was working on their collagraphs. I knew I had once had a large supply, but couldn't find it, and figured I'd have to buy some for this class. At least the black. So in one trip I moved some heavy tools and found a nice supply of ink. Still more tools and supplies to bring there, not to mention the ink and paper I still need to order, but today's effort will make my work next week a bit easier. 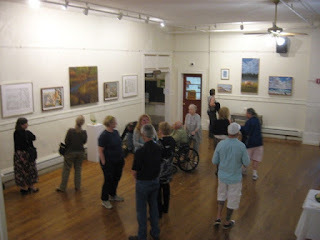 The exhibition in Ocean Grove is up and we got a good crowd yesterday. So now it's time to get back to the business of making art. Entries for the bird themed show in Belmar are due in about a week and a half. That is digital images for the entries are due, so the finished framed piece does not need to be ready. But that means I still need to get a finished one ready to photograph. Rain would keep me from mowing the lawn again today, so it seemed a good day to get going on this project. The block was finished on Friday, and over the weekend I tracked down my ink supply and various tools. This morning I grabbed some paper from my supply at home, plus everything else I would need. In the early afternoon I drove up to the Studio. Experiments from earlier this year showed me that water washable inks do sometimes redissolve and leak back into watercolor, despite claims to the contrary by the manufacturers, so I went with straight oil based ink today. Above is the first proof from the new block, the best one from today. The second proof shifted a little during printing (an occasional problem with the heavier paper I chose), so I'll use that one for working out the color choices. Brought the proofs home to dry, in case I can't get back up there in the next few days. 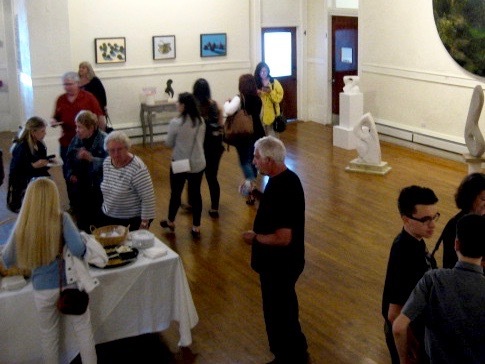 After two years of WinterArts shows where we often battled the elements, they decided this year to move the annual art show to the edge of summer. Definitely no snow or ice today, even a bit of sun. Of course, that also means more summer traffic in town, which means much less available parking. I got there more than 30 minutes before the start, but cars were already starting to fill the back lot. Forget the main lot. A glance up the street told me that the back lot was my only option at that time, so that's where I went, hoping I wouldn't be blocked in. We seemed to have a pretty good crowd today, with people coming and going all day. Probably more than we had for any of those winter days. There were several people I knew from the building, and several I knew from Belmar, who had never been in the building before but were very pleased. Part of the point of these festivals is to raise awareness of what the Jersey Shore Arts Center has to offer, so in that sense they had some success today, and I relayed these conversations to a building representative. 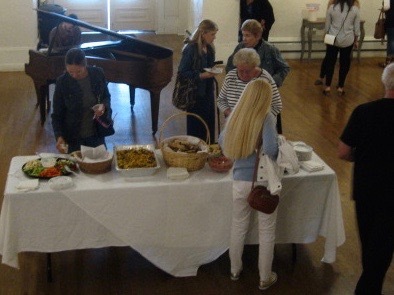 As with other festivals, food was provided, I assume from an outside caterer as I didn't see any cooking going on. I had eaten lunch at home a few hours prior and never did get hungry enough to want to eat more. Maybe there will be some leftovers around the building tomorrow. Unlike the previous festivals, I'm told this one was organized as a juried show, a process that caused some concern for some of the less experienced artists, though obviously many figured out how to get into the show. 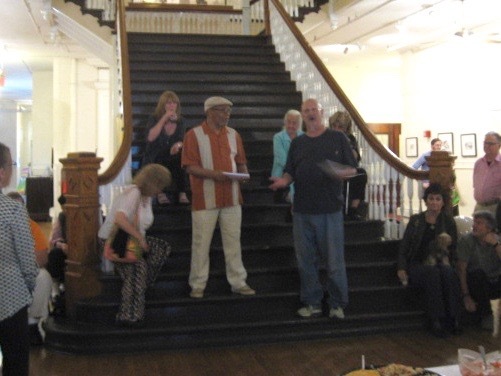 As part of that, there were prizes for artists in several categories, though printmaking wasn't one of them. 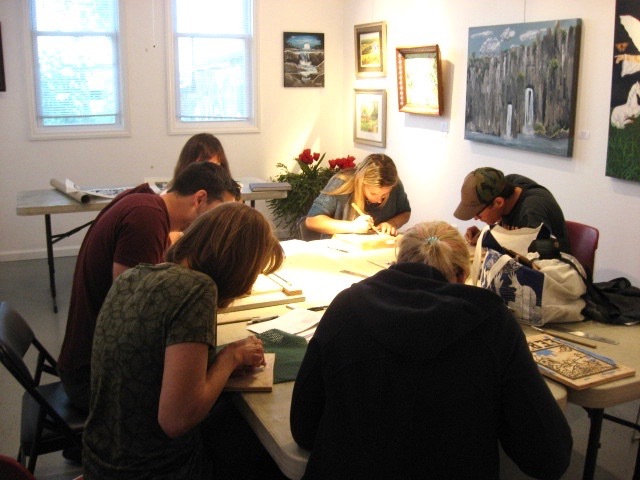 (and I wasn't the only printmaker- I saw several stone lithos, and one artist entered some Japanese style fish prints) I believe they were gift certificates for art supplies relevant to the category. I won't be selling my piece in the show (as far as I know it is my last surviving copy and the block was destroyed), but I may have lined up a paid appearance, so my streak of making good connections through JSAC festivals continues. 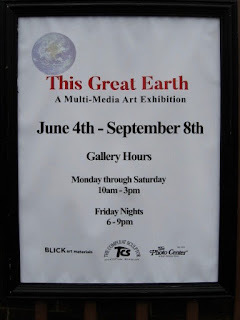 The This Great Earth Multi-Media Art Exhibition will remain on display through September 8, 2017. It's on the walls inside, so I guess it's open any time the building is open, which will be most of those days if not all of them. Attendance is free. Last night I found I had received an e-mail from one of my former co-workers, telling me of a plan to drop off work for the incoming Belmar show, but wondering if this would be able to happen. Too late to find out anything on my own, so I decided the best thing would be to go to the Boatworks early the next morning in case I needed to meet them and let them in. As it turned out, Rebecca had gone in early to meet them and was already there, and within 10 minutes the van showed up with a big entry for the new garden themed show, a few staff, and even a few clients in wheelchairs, if only because this would mean less coverage back at the center. There were some van lift issues, and confusion about how to set up the piece, but it all got straightened out on a timely basis. And I got to go have a nice lunch at home. In the afternoon I went up to the Studio and finished the cutting of the new saint block. Took about an hour, about what I had expected. 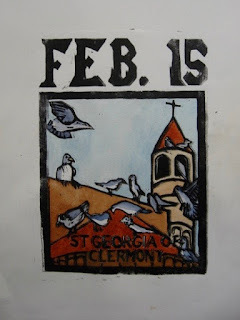 Cut out the feast day at the top, and widened the margins around the image. Have about two weeks until the entry is due, so I'm well ahead of deadline. Yesterday afternoon I had noticed by piece for the upcoming show was leaning up against a wall on the 1st floor. Today that piece was hanging on the wall in the same area, so I guess that's where it will be. When I had arrived today the hallway was dark, but as I was leaving the lights were on an I could get a photo. I didn't remember there being a payphone there in the hallway, but this old building is full of antiques, so why not? Took care of other business in the morning, and then got up to the Studio in the early afternoon. No new information about the big show this weekend, though I did see my piece on the 1st floor today. Maybe I'll be able to get more information on my next visit. Had two other purposes today. First, I picked up and packed the two boardwalk prints I had produced this year. Not new prints, just reprinting ones I had completed a few years ago, but the exhibition this past winter resulted in two being ordered. Spent the past few months coloring them, as shown on this blog. Those are now home and safe. Second, more work on the St Georgia block. As planned, started by cleaning up and redrawing some of the architectural details in the immediate foreground. 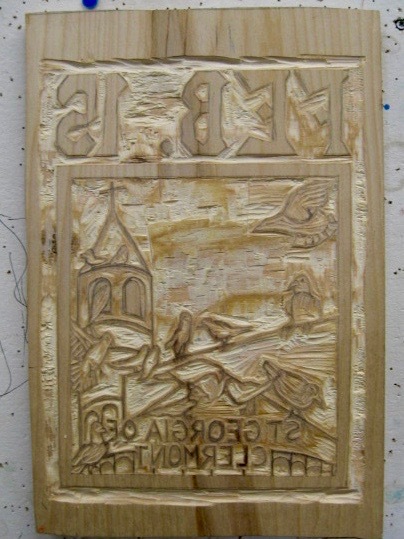 Then I finished cutting everything in the main panel- the architecture, the letters, and even cut out the insides of the birds. Still have to cut out the letters and expand the margins a bit, but this means I should have it printed by the end of next week, leaving plenty of time to color it before the submission deadline. Toward the end of the day I learned that I now have a third student signed up for my woodcut class in Belmar later this month. I'm going to have to order more ink and paper than I had expected, but this is a good thing overall. I also learned that the corporate gallery space I was recently showing in was very impressed with my contribution (boardwalk Wheel Game print), with one of the gallery people there saying she would have bought it if she could afford it. Story of my life.